The days of physical data rooms with rows of files and cabinets storing proprietary data are long gone. But, finding the most efficient and cost effective place to store data can still be challenging. Luckily, we are able to store data on the cloud which eliminates many safety concerns and data failures. Virtual data rooms help increase data management productivity and security. Let’s take a look at everything you need to know about virtual data rooms. Before there was an option to store data on the cloud, data rooms were physical rooms that were highly secure and had constant surveillance. They were a place where authorized parties could access sensitive information about a company. The room was usually located on a company’s premises, or at another secure site, such as their lawyer’s offices. Due to the sensitive nature of data rooms, detailed logs had to be kept of every person who accessed the room, what documents they looked at, and which versions they saw. A virtual data room (VDR) is a secure online space that acts as a repository of your company's documentation. You can share critical business information with clients, investors and company leadership over the internet in a controlled environment. Companies can facilitate their due diligence process with a VDR and increase ease of access for all parties. Another benefit is reduced overhead as you don't need to invest in office supplies. VDRs now mean cloud data storage, but depending on the chosen provider, the capabilities and features can widely vary. Some VDRs are truly just a place to securely store and access data, others include additional features such as diligence, pipeline, and integration management. When Can You Use Data Rooms? You can use VDRs anytime you need to disclose documents safely and efficiently. Many industries now use virtual data rooms to store and access company information. Banks and financial institutions - Whether it's a high-profile loan document or a new venture, financial institutions use VDRs for secure transactions. Accounting and audit companies - Companies can share reports and audits with clients over a secure platform. Healthcare - Don’t worry about confidential documents like clinical trials and research findings. Disclose them over a VDR without a worry. Business agents - A VDR provides an accessible means to share information on deals and closures. Risk capital - Helps disclose documents on investment management and finance management. Immovable property - Land and housing deals require copious amounts of document exchanges. A VDR comes in handy no matter what immovable property industry you’re looking at. Consultancy - Confidentiality and privacy are top priorities of consultancy businesses that require a controlled environment; a VDR handles it with ease. Manufacturing- Manufacturing industries use VDRs to share new designs or product data. Who Uses Online Storage and Document Sharing? 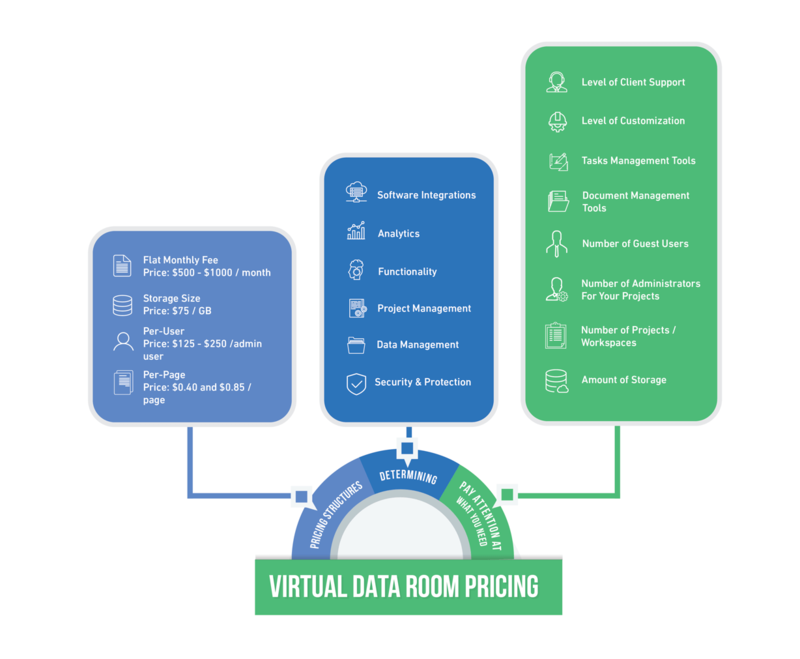 Investing in a VDR makes sense when you don't want to tie up resources with a physical data room. Business owners, clients, suppliers, acquirers, leaders, and managers are suitable candidates for a VDR. Many different industries use online rooms including private equity, corporate development, investment banking, legal firms, startups and investors, real estate, IPOs, renewable energy, and more. Setting up a DealRoom virtual data room for a sell or buy-side transaction only takes a few minutes, but saves users a large amount of time during diligence. Here are the common sell and buy-side steps customers take when setting up their room. However, at DealRoom, we understand that no two deals are alike and are happy to offer more guidance if needed. Workflow Consultation: First, every customer is designated a customer success manager. This customer representative sets up a phone call / screen share with a member of your team. The purpose of this is to learn more about the team’s current workflows and tools. From there, the customer success manager gives guidance on how your team should use DealRoom’s functionalities to improve efficiency and overall process. Content Conversion: The client sends their Excel tracker and folder structure to their designated customer success manager. If they need help with structure, you customer success manager can assist with the format and upload the newly laid out tracker into your room. Functionality Overview: Next, the customer success manager makes sure that users, including the management team, the client, and potential buyers, are fully comfortable using the platform. This is when teams go over how to create groups, set permissions, create requests, and more. Additional Training: Throughout the deal’s lifecycle, teams can contact their customer success manager or customer service 24/7 for training and assistance. If a customer has a bigger team or needs additional help, a tailored onboarding process can be created. Platform Customization: A customer success manager works with your team to identify additional features needed to fit your specific needs. Premium Integration Support: In order to give our customers the best digital tools available, we choose to integrate with additional software platforms that are innovative leaders in their perspective realms. Our customer support team can integrate DealRoom with Salesforce, Slack, and Office 365. DealRoom is the industry’s leading virtual data room and project management software that creates a better M&A experience. Data storage, diligence tracking, and communication tools are all on one integrated smart platform, which allows users to eliminate duplicate work, track progress and get insightful analytics. Google Drive is a cloud storage platform with office collaboration tools like spreadsheet, word processor and presentation. You can get 15 GB of free space and grant different levels of permission like viewing, editing and downloading documents. However, Google Drive does not always meet financial industry security and compliance standards. iDeals offers a secure platform to meet the strategic goals of organizations. You just need 15 minutes to deploy the solution which is ready to be used out-of-the-box. You can easily upload documents using drag and drop and manage intuitive document rights. Keep in mind though that iDeals pricing structure has administrators, users, data, and project limitations. ShareFile uses multi-level access permission and 256-bit SSL encryption to offer a reliable file sharing solution. It's ready for real-time collaboration and you can automate workflow like requesting approvals, collecting e-signatures and generating feedback. ShareFile does not have diligence management capabilities, so teams will still need to use Excel trackers. Intralinks is built to leverage M&A for global banking, deal-making and capital market transactions. It comes with strong data protection, Information Rights Management, and upgraded user interface to secure your transactions. Intralinks charges per-page and has steep overage fees, so for lengthy deals with hundreds of thousands of documents, it won’t be the most affordable option. SecureDocs offers unlimited storage and users in a fixed monthly charge. You can take advantage of different features like watermarking, permission-based user roles, audit trail reporting, built-in e-signature and so on. However, as with other traditional VDRs, SecureDocs lacks diligence management capabilities. The price of virtual data rooms depends on a number of factors. Some providers charge $99 per month for their basic plans while you can expect to pay around $200 or more for extra features and specifications. Some companies also charge on user-basis, so it's difficult to quote a fixed price. The seller and buyer need a controlled, safe, and easily accessible environment to view the confidential information regarding the transaction. VDRs enable clients to remotely access, share, and download documents and files. Users can control access to the information, while granting 24/7 availability to those who need it. They also have access to insightful data such as document activity, user activity, and buyer engagement. Modern VDRs bring more to the table than just secure online storage. Software, like DealRoom, provides M&A teams with not just an innovative VDR, but diligence management as well.